The most common cause of blistering sores in children is called impetigo, an infection often passed on in crowded or unsanitary environments. The sores are small, no larger than 1 to 2 millimeters across, and often appear in groups on the child's face, arms or legs. 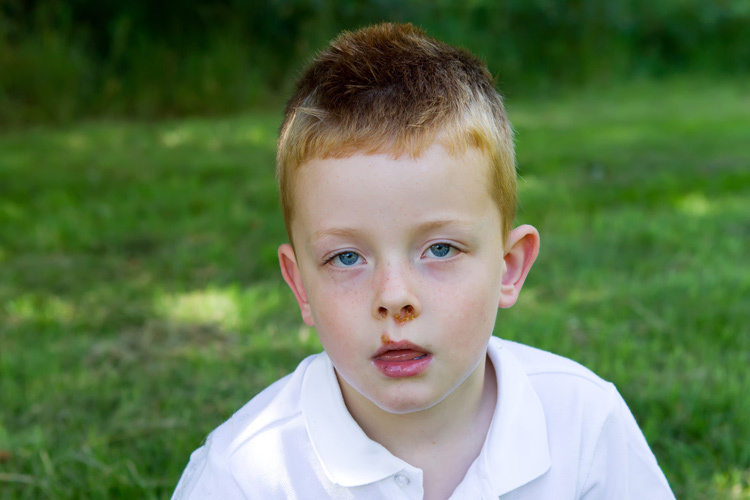 In bullous impetigo, the sores can be much larger, up to a half-inch in diameter. Washing won't clear up the condition; this bug has to be fought from the inside out, and it is not just a minor rash, but can be a serious condition. It is a skin infection usually caused by a streptococcus or staphylococcus bacteria. A doctor should diagnose this condition and prescribe an appropriate antibiotic. A penicillin injection may do the trick, but if your child is allergic to penicillin (or just afraid of needles), and when the bacteria is resistant to penicillin, erythromycin taken in pill or capsule form for ten days is equally effective. While the medication is working, try to prevent your child from picking at the crusts and scabs that form over the sores. Keep hands and fingers clean by frequent washing. In the meantime you should be cautious about keeping family wash cloths, towels and other linen separate, to prevent the spread of this infection to other members of the family. Be sure to wash and clean your youngsters cloths most carefully, keeping them separate from your other laundry, and boiling them or washing them in very hot soapy water. Impetigo is a skin infection caused by germs. It's most common in children and is contagious. Impetigo forms round, crusted, oozing spots that grow larger day by day. The hands and face are the favorite locations for impetigo, but if often appears on other parts of the body. How does one get impetigo? While the germs causing impetigo may have been caught from someone else with impetigo or boils, impetigo usually begins out of the blue without any apparent source of infection. Antibiotics taken by mouth usually clear up impetigo in four to five days. It's most important for the antibiotic to be taken faithfully until the prescribed supply is completely used up. In addition, an antibiotic ointment should be applied thinly four times daily. Ointment is advised and can be purchased without a prescription. 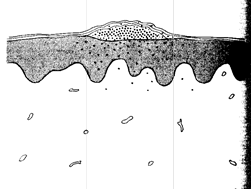 Crusts should be removed before the ointment is applied. Soak a soft, clean cloth in a mixture of one-half cup of white vinegar and a quart of lukewarm water. Press this cloth on the crust for 10 to 15 minutes three of four times a day for as long as you see crusting or oozing. Then gently wipe off the crust and smear on a little antibiotic ointment. You can stop soaking the impetigo when crusts no longer form. When the skin has healed, stop the antibiotic ointment. Impetigo is contagious when there is crusting or oozing. While it's contagious take the following precautions: 1. Patients should avoid close contact with other people. 2. Children should be kept home from school for one or two days. 3. Use separate towels for the patient. His towels, pillowcases, and sheets should be changed after the first day of treatment. The patient's clothing should be changed and laundered daily for the first two days. All these measures are only needed during the contagious crusting or oozing stage of impetigo. Usually the contagious period ends within two days after treatment starts. Then, children can return to school and special laundering and other precautions can be stopped. If the impetigo doesn't heal in one week, please return for evaluation.